An outstanding, feature-rich cordless DECT phone at an affordable price, the BT Diverse 7150 Plus comes equipped with an answering machine and a SIM card reader for transferring contacts from a mobile phone. Compatible with repeaters and expandable with up to five additional handsets, this bundle comes with a pair of cordless phones. The base station sports a convenient SIM card reader allowing you to copy over all of your contacts from your mobile phone without having to manually enter them again. Also providing a write function, you can copy over your contacts to your mobile phone. The BT Diverse 7150 Plus provides a phonebook with space for 100 names and numbers. With the BT Diverse 7150 Plus at hand, you never have to worry about missing an important phone call while you're away. The base station is equipped with a digital answering machine with 27 minutes of recording time, and you can manage your messages directly from the base station or from either of the registered handsets. Thanks to a remote answering service, you can also securely access your messages from an external phone. 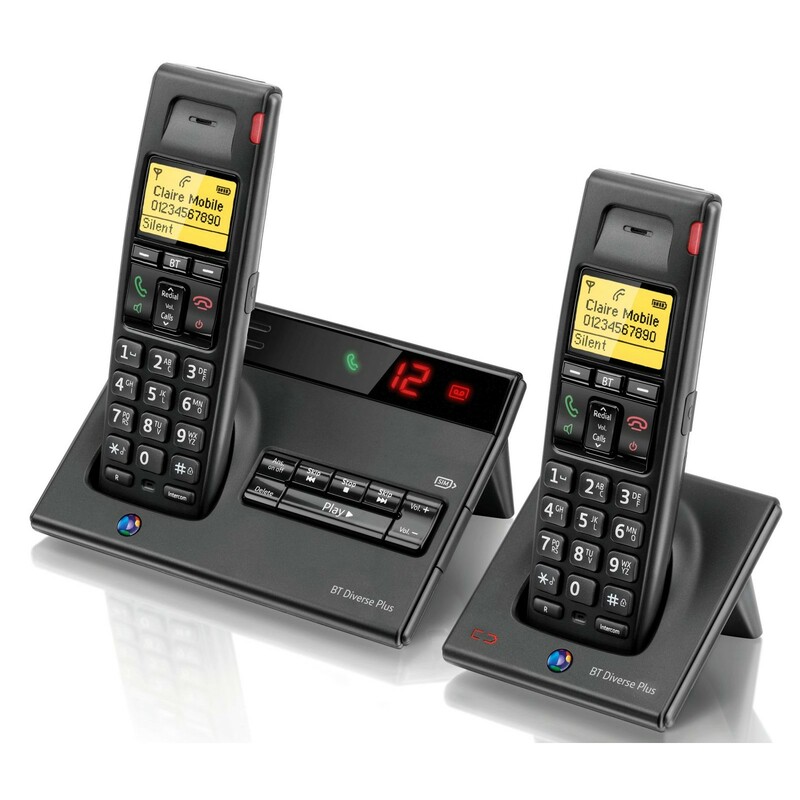 The compact and stylish handsets sport backlit displays and large buttons and excellent hands-free functionality by way of a speakerphone or optional headset. Offering ease of use and an excellent range of functions, the BT Diverse 7150 Plus is an affordable home or business phone.